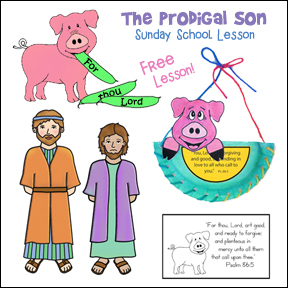 The following crafts and activities are from the Sunday school lesson "Jesus and the Big Parade" on The Resource Room. 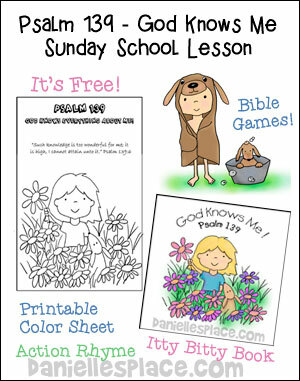 This lesson and hundreds like it are available to members as a yearly subscription for $23.95 or as an Instant Download for $3.95. 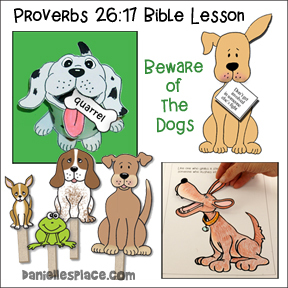 Included in this lesson: Printable Bible Verse Cards in both KJV and NIV, Interactive Bible Lesson, Five different Printable Bible Crafts, and Five Bible Verse Review Games. 2. In class help the children trace the palm branches onto green paper using the precut templates and cut out the green palm branches. Kindergarten children should be able to do this. If you have younger children you may want to have the pattern already traced onto the green paper. (Make a few extras for late arrivers. Make sure each child has one before starting the lesson.) 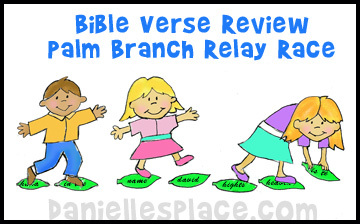 Instead of using the Bible verse cards, you can print the memory verse onto the palm branches for the children to take home. 1. 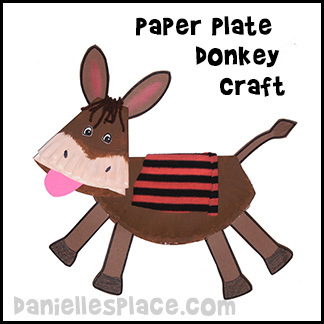 Before class fold the paper plates to make the donkeys. To make the head, fold a paper plate almost in half as shown in the picture above. 2. Measure 3 3/4" in from the sides of the folded edge of the paper plate. Fold the sides back 3 3/4" to form the head shape as shown at the left. Glue or staple the sides together on the back. 4. Glue the head to the body as shown. 5. Draw ears, legs, and a tail as shown in the picture onto brown construction paper or use the patterns, and cut them out. 6. 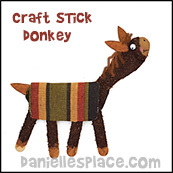 Cut coat shapes from pieces of material, and cut brown yarn into short length for the donkey's mane. 7. 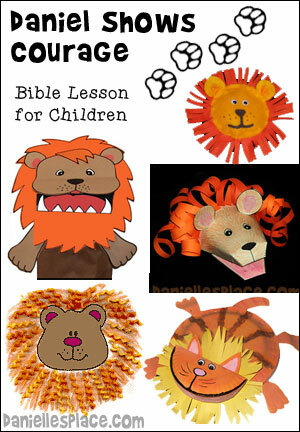 In class have your children paint or color the paper plates, and glue on the ears, legs, tail, coat, and yarn. 1. Before class print out the patterns onto card stock and cut them out. 2. In class have your children color the patterns, tape the feet pattern into a loop so that they fit around an egg, and tape the palm branches into the hands of the boy. 3. If you are using plastic eggs, you can place some treats inside the eggs before placing them in the egg holders. You can use real eggs and have your children decorate them before placing them in the holders. 2. In class have the children color in the donkey's hooves with a black marker or crayon. 3. Have the children paint white glue all over the donkey. 4. Let them sprinkle tea leaves from a tea bag onto the donkey covering the whole thing but his hooves. 5. Tie on the jute string to look like a halter. 6. Glue on wiggly eyes, some fake fur for its mane, and a piece of material for a blanket. Before class print out the activity sheet and make copies. 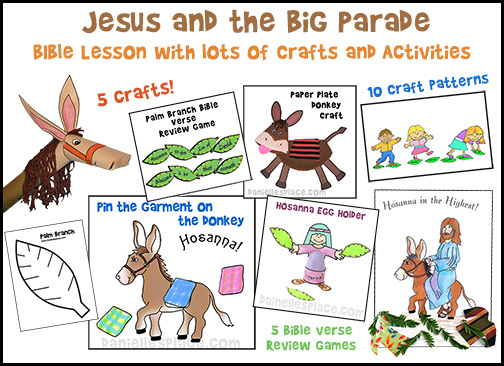 The patterns for this craft are available to members or as an instant download with the "Jesus and the Big Parade" lesson. In class have your children color the picture and then glue leaves and cloak shapes cut from fabric onto the bottom of the page. You can use real leaves and pieces of material cut into coat shapes or use the branches and cloak pattern provided in this lesson. 2. If you don't have wrapping paper rolls, cut a piece of large poster board in half lengthwise and roll up the pieces lengthwise. Each roll makes one donkey's body. 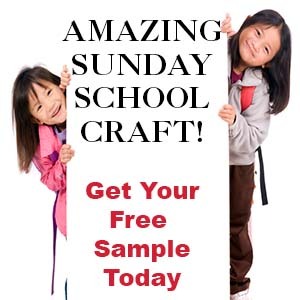 If you don't want to buy poster board, you can also roll up newspapers and cover them with brown paper or have the children paint them brown. 3. Cut pieces of yarn about 9" long. 4. In class have the children color their donkeys. 5. To assemble, pre fold the dotted lines. Roll the head part of the donkey around so that the mouth and reins meet. Tape down the length of the head. Next, tape the end of the nose. This is a little tricky, but pretend you are wrapping a present without the present inside. Press in on both sides of the donkey's nose and bring the lower end up and the upper end down over the lower part. Tape it closed. 6. 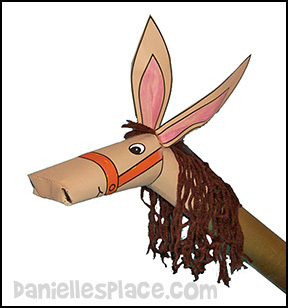 Tape the neck part of the donkey's head onto the cardboard roll so that the dotted lines match up with the end of the tube. The head part will come down over the hole of the tube. Tape it down so it doesn't move. 7. Make a small dart at the bottom of the ear, fold up at the bottom of each ear and glue or tape them onto the head. 8. Have the children glue on the donkey's mane. Place a line of glue down the length of the tube about 3 or 4 inches. Have the children lay the yarn over the glue so that the middle of the yarn pieces are in the glue. Play "Pin the Cloak on the Donkey"
2. 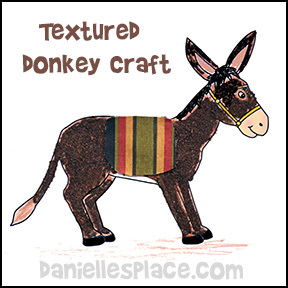 Color the donkey if you are using the black and white pattern. 3. In class have your children color their cloaks or write their names on them. 4. Play like "Pin the Tail on the Donkey" but use rolled up tape on the back of the cloaks instead of thumb tacks. 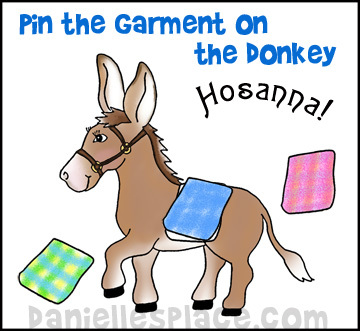 Remind your children as they play that the disciples took off their cloaks and placed them on the donkey for Jesus to ride on. 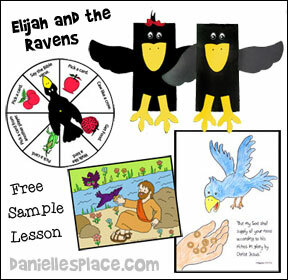 These leaves can be used to play a variety of Bible Verse Review Games. Play a Match Game - Print out two sets of leaves and have your children take turns turning over two leaves at a time. If they match, the child gets to keep the leaves. When all the leaves are matched have your children place the leaves in order to spell out the Bible verse. Play a Concentration Game - Make a set of cards for each group of three or four children. Have them take turns turning over the leaves. They must turn the leaves over in order to spell out the Bible verse. If a child turns a leaf over in the wrong order, the next child takes a turn turning over the leaves. 1. Before class print out leaf shapes onto green paper and cut them out. Make a set of leaves for every four to five children. 2. In class break your children up into teams and give the first person in line a set of leaves that are arranged in random order. 3. Write the verse on a board so that all the teams can see it. Tell your children that they will pretend to be donkeys and that they can only move by stepping on the leaves. 4. The first person in line must set the leaves on the floor in order of the verse and use them as stepping stones. 5. The rest of the children follow the leader. When the leader steps forward on the newly placed leaves the children behind him can step on the leaves the leader left behind. 6. When the leader gets to the other side of the room he continues the path with a U-turn that leads back to the start line. 7. The first team to get all the children on the other side of the room and back wins. If one set of leaves does not reach all the way to the other side and back, the child at the end of the line must pick up the leaves off the floor and pass the leaves back up the line to the leader. The leader can then place those leaves on the floor and continue the path. 8. When the whole team reaches the starting line they must then say the verse together to win. Tell your children to sit down and then ask them how they think Jesus might have felt on that day and then how the people might have felt. 1. Before class make Milk Jug Donkeys, Stick Donkeys or Paper Bag Donkeys, for the kids to use for this game. 2. Break your children up into teams and give one child in each team a stick donkey. That child will pretend to be Jesus. 3. Give each team three paper palm branches or cloaks. You can use pieces of material for the cloaks. 4. 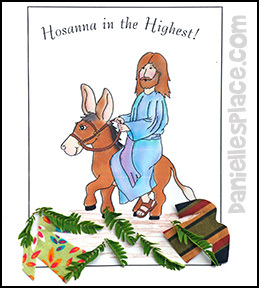 The children who aren't Jesus place the palms branches in front of "Jesus on the Donkey". 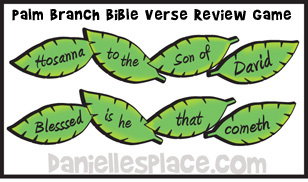 "Jesus on the Donkey" walks forward on the "branches". 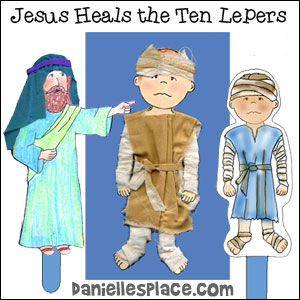 The children must pick up the branches behind Jesus and then place those in front of him so he can move forward. The team that enables Jesus to move across the room to the finish line first wins. 1. Use a large 8" plate to cut a circle from construction paper for the wreath base. Cut a smaller circle out of the inside. 3. 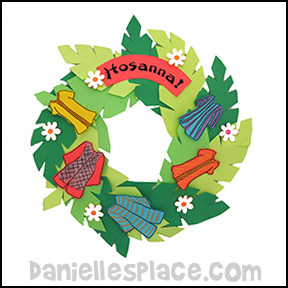 Print out the Coat Patterns and Hosanna sign onto different colors of paper or white paper, color them, and cut them out. Glue the coats on top of the palm branches. 4. 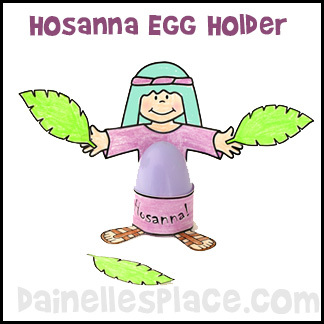 Glue the "Hosanna!" sign to the top of the wreath. 5. Two finish glue fun foam flower shapes to the wreath. 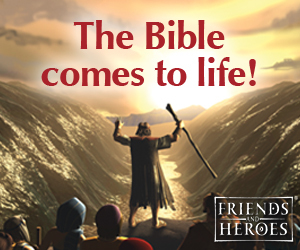 Answer Buzzers - A great way to step up your Bible Review Games! Bedtime Prayers That End with a Hug!